The Sightmark 3x Tactical Magnifier offers versatility by increasing the magnification of accompanying sights for greater range and improved target acquisition. In one swift motion, the new flip mount design makes it fast and easy for shooters to increase their magnification for accompanying sights, creating a greater engagement range in any situation. The durable magnifier has been redesigned to provide increased eye relief, making it safe and comfortable to use for higher caliber weapons. The new Sightmark 3x Tactical Magnifier Pro has been improved with a rubber armor housing for increased durability, providing 3.5 inches of eye relief for refined shooting comfort. Shooters are aided with improved target recognition with the new 3x magnifier that also features external windage and elevation adjustments for reticle alignment. 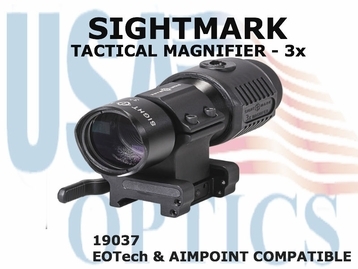 This Sightmark 3x Tactical Magnifier Pro is also EOTech and Aimpoint compatible.